Mutiara Taman Negara is a resort located in a 15-acre jungle sanctuary within the Taman Negara National Park with 108 chalets, bungalows and guest-houses, all built Malaysian-style, complete with natural timber for rustic charm. All rooms have hot and cold showers, air-conditioning and ceiling fan except the dormitory. 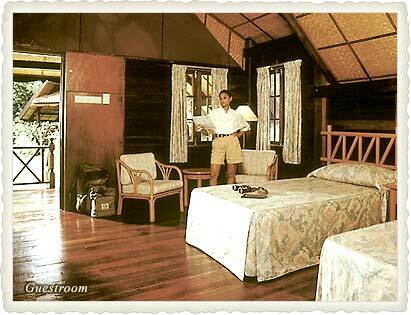 Bungalows and chalets suites have tea and coffee making facilities and verandah with river view. Also available are dormitories, hostels and a 2.5 acre camping ground nearby the resort with amenities such as toilet, bathroom, lockers and kitchen. Tents and sleeping bags are available for hire. There are 8 beds in each dormitory room with individual locker provided. Common bathrooms separated for male and female are located in the center of the building. The plenary sessions are held in Bayan Nuri Hall which can accommodate up to 200 persons. Meals will be at Seri Mutiara Restaurant. A daily shuttle service plies daily between Kuala Lumpur to Kuala Tembeling via Jerantut (the jump off point to Taman Negara). The cost per person per way is RM40 and depart from Istana Hotel at 8am. Kuala Tembeling departs from the jetty at 1pm. Alternatively you will have to take either private transport by van or limousine costing approximate RM300 per way or by public transport from Kuala Lumpur or Kuantan, and it takes approximately 3 - 4 hours from these points to Jerantut. Taxi and bus services regularly ply this route from Kuantan main bus terminals or Pudu Raya bus station in Kuala Lumpur. From Jerantut, a 16km ride in a bus or taxi brings you to Kuala Tembeling. From here, simply follow the signs to Taman Negara. From Singapore, a night train brings you right to Tembeling Halt, and from here you can walk to the jetty, which is only half an hour away. From the Tembeling Jetty, the Park's Headquarters at Kuala Tahan, is a 2½ or 3½ hour boat ride up the Tembeling River. This boat ride costs between RM38 per person return trip. Boats depart from Kuala Tembeling at 9am and 2pm daily. You will arrive at Kuala Tahan Village by road. Traffic coordinators at the Car Park area will direct you to your respective Resorts. At Rainforest Resort and Woodland Resort there are car parking areas. If you are staying at Mutiara Taman Negara Resort, you will have to take the staircase to the riverside. Motorised rafts are located at LIANA floating restaurant to take you across the Tembeling River to Mutiara Taman Negara Resort. The Seri Mutiara is spacious and air conditioned which can accommodate up to 200 persons. It serves both international buffet breakfasts, lunches and dinners and offers ala carte too. 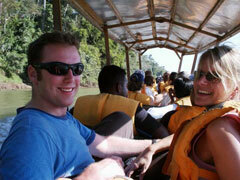 The Recreation Desk offers a wide variety of guided recreational activities and excursions available in Taman Negara. Activities include Canopy Walk, Lata Berkoh, Rapids Shooting, Fishing, Visiting Orang Asli, Night Jungle Walk and many others. © 2006 DiscoveryMice for APECO2006. All Rights Reserved.Discovery Trery Travel Channel. All Rights Reserved.